A year and a half after President Trump first blasted the cost of the presidential planes as “out of control,” aerospace giant Boeing Co. has officially landed the $3.9-billion contract for the next generation of Air Force One jumbo jets. The contract, announced by the U.S. Air Force on Tuesday, will include detailed design, modification, testing and certification of the two 747-8 jumbo jets. The announcement comes five months after the White House said it reached an “informal deal” with Chicago-based Boeing to pay $3.9 billion for the aircraft. At that time, Deputy Press Secretary Hogan Gidley said Trump’s negotiations saved taxpayers more than $1.4 billion, a claim that was repeated in a statement Wednesday from the White House. But an aviation analyst has said the new Air Force One planes were always expected to cost about $4 billion. And Defense Department budget estimates for fiscal year 2019 project that the Air Force One program will cost about $3.95 billion through fiscal year 2023. Trump first criticized the price of the program via Twitter in December 2016, saying that the planes would cost “more than $4 billion. Cancel order!” Boeing Chief Executive Dennis Muilenburg then met with Trump and told reporters that they would cost less than $4 billion. The planes are already built. They were originally ordered in 2013 by a now-defunct Russian airline that never took ownership of the commercial aircraft, as reported by trade publication Defense One. Boeing will add special features, such as defense systems and structural modifications designed to provide extra protection to those on board. The new planes will replace the modified 747-200 jets that have been in service since President George H.W. Bush’s administration in 1990. Over their years of service, the planes have been upgraded with safety, self-defense and avionics improvements. But as the aging commercial fleet of 747-200s leaves service, the supply of replacement parts has dwindled, according to an Air Force official. 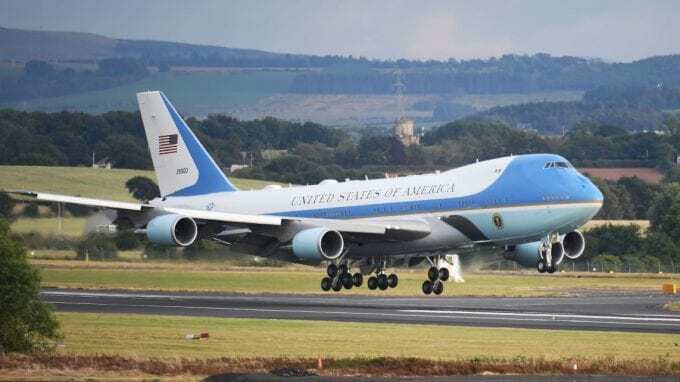 There are newer two-engine commercial airliners than the 747, but a four-engine plane is required to meet the electrical power production, safety and aircraft size and weight needs of Air Force One, the official said. The special equipment allows the president to direct military forces and even launch nuclear weapons from the plane during crucial moments, Harrison said. On Tuesday, Trump told CBS News that cosmetic changes are also in store for the new Air Force One planes. Kennedy gravitated toward the robin’s egg blue color because “she felt it was understated, but memorable, and President Kennedy agreed,” he said. Since then, presidents have maintained that light blue exterior and the plane has become a recognizable American icon, in the vein of the Statue of Liberty or Mount Rushmore. Work on the new planes will be done in San Antonio and is expected to be finished by December 2024, according to the contract award listing on the Defense Department’s website.